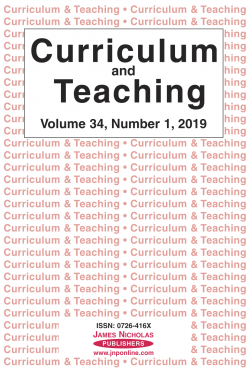 Curriculum and Teaching, first published in 1985, is an established, refereed international journal publishing original research from throughout the world which deals with major up-to-date issues and trends in curriculum theory and practice. The journal uses a balanced and comparative perspective to consider curriculum design and development, evaluation, curriculum models, comparative studies in curriculum, innovation and policy, planning, and educational administration. The journal’s object is to advance the study and development of curriculum and teaching, with a view to improving teaching and pedagogy. Curriculum and Teaching provides an impartial forum for scholars throughout the world, working in the area of curriculum studies. Curriculum and Teaching is double blind peer reviewed. The journal has no publication fees. Cheng, Michelle W.T. ; Lee, Katherine K.W. ; Chan, Cecilia K. Y.